is seeing her carry her basket around and plop the onions and bell peppers in and keep walking. She talks to all the old farmer men and they push back their farmer hats and take a minute to make a little girl feel special. 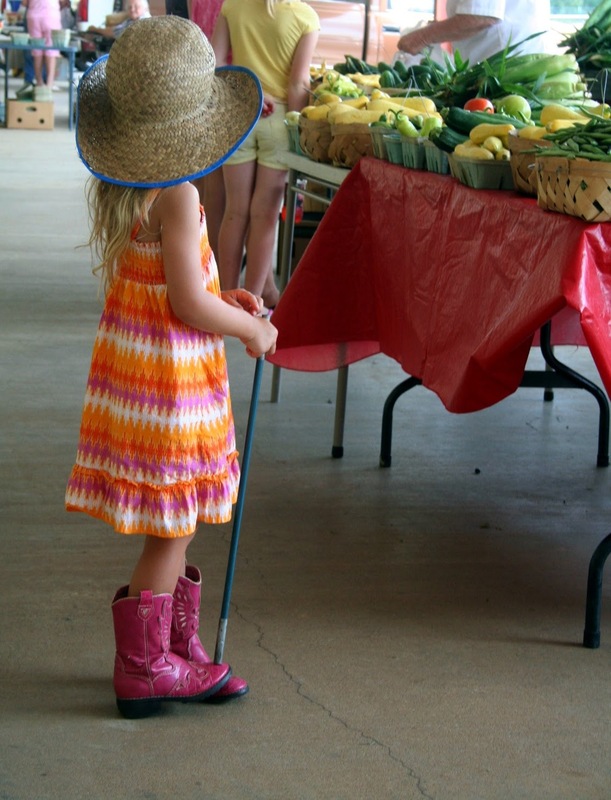 Only at the local farmers market can a little girl carry a tent pole around and be right at home :). They were selling fresh flowers and when Channie-mae walked by they asked her if she wanted one. She looked at me and said "how did they know I'm my daddies flower?" "..hmmm I don't know Channie, they could just tell".. Her face was as proud as a peacock in spring. "Excuse Ma'am, but did I hear you say you had 8 kids?" and he replied, "I have a bushel of squash and I don't care much about loading it back up and lugging it home, would your kids eat it?" I smiled thinking he thought maybe I was a needy mama..but I smiled and said "sure we'd love it"
.. The niceness of strangers should never be turned down. I'll pass it forward and share this squash with someone else. I bought ears of corn for supper. 15 ears for $4.00.. this is great eating for a big family. I came home and everyone helped shuck it. Little fingers pulling back the corn coat and looking for their piece of corn. They acted as if their cob might not be in there and when they got to the gold stuff they yelled and cheered. I had a big pot waiting with boiling water and when they got their corn all clean I threw it in the boiling water and we waited. people inside but it drives us out. The kids taking a shower underneath the drain faucet. The rain drops washing the heat off their little bodies. I sit and swing and laugh and remember. we would take showers in the rain. to remember their own rain showers. Dancing, playing, and laughing in the rain. that God gives us today.